Information Forestry, December 2007—Many insects rely on scent to communicate with each other and to find food and hosts. 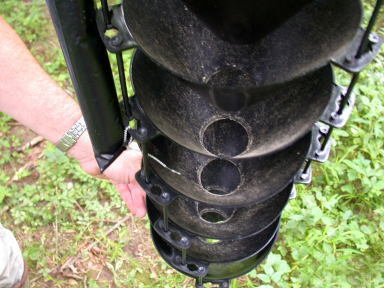 Setting out traps baited with insect and host-tree smells has long been a technique used by plant health officials to detect and track unwanted pests. But the scents currently used by the Canadian Food Inspection Agency (CFIA), the federal organization responsible for keeping Canada’s forests safe from alien forest pests, fail to entice all insects of potential concern into detection traps. For instance, baited traps have yet to consistently capture emerald ash borer or Asian longhorned beetle, two non-native insect species infesting regions of southern Ontario. Scientists at Natural Resources Canada are helping the CFIA close these gaps by testing new lures and scent combinations. Plant-protection officials set out insect traps baited with scents that attract beetle and moth species to detect and monitor the presence of forest pests. Canadian Forest Service researchers are trying to determine the most effective scents and scent combinations to lure non-native wood-boring and bark beetles into traps. The researchers are testing combinations of scents released by common host trees, in addition to insect pheromones—scents released by insects that prompt behaviours in other members of the same species. Lures based on tree scents, which include ethanol and components of turpentine, entice broader ranges of insect species by mimicking stressed or injured trees—the preferred targets of most wood- and bark-boring insects. Humble, Sweeney and deGroot began testing in 2006. They placed lures at sites in Nova Scotia, Vancouver and southern Ontario that are considered high risk for introductions of alien forest insects. Sites include ports, freight depots, and warehouses. The scientists are documenting and analyzing results collected during the last two years, and will be setting out test traps again in 2008.